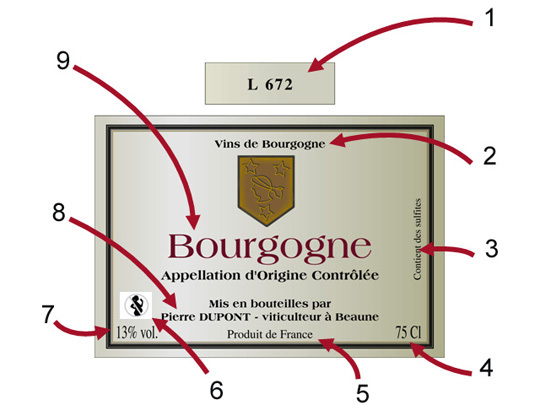 The compulsory details that feature on the label of Bourgogne wines meet several quality and information objectives. Governed by EU regulations, they provide clear details to guide your choice of wine. • The name of the wine, a reference of authenticity. 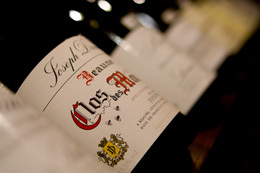 It tells you about the terroir from which the wine was produced and ensures the respect for strict specifications. This is associated with mention Appellation Contrôlée/Protégée (AC/AP) or Appellation d’Origine Contrôlée/Protégée (9) (AOC/AOP). • The name, registered company and the address (8) of the bottler, whether this was the producer him- or herself, or a cooperative cellar. This is usually made up of recognized formulas like “Mis en bouteilles par” (Bottled by) or “Conditionné par” (Packaged by). • The country of production (5), if the wine is destined for export. • The batch number (1), which allows for monitoring of food and drink products. This number, preceded by the letter “L”, is not always found on the label or back-label. It is sometimes found on the foil cap which covers the cork. 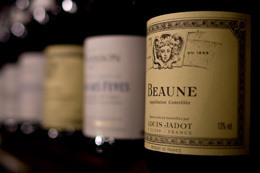 Since 2002, the Bourgogne wine board has required an additional compulsory mention (2), with “Vin de Bourgogne” appearing on labels whatever the level of the appellation, or “Grand Vin de Bourgogne” in the case of Villages, Premier Cru and Grand Cru appellations. • The label specifies the capacity of the bottle (4) in liters, centiliters or milliliters. • The alcohol content (7) appears in the form of a percentage of volume, with a tolerance of 0.5%. This is sometimes preceded by “alc.”, “alcool acquis”, or “titre alcoométrique volumique acquis” (TAV or TAVA). • The wording “contains sulfites” (3) is obligatory, if their concentration is greater than 10mg/l. It can also be replaced by one of the following phrases: “contient du dioxyde de soufre” or “contient de l’anhydride sulfureux”. • Milk- or egg-based products can be used to fine wines, in order to leave them clearer and brighter. The majority of these products is eliminated during filtration, but traces may remain. The following mentions are authorized, always preceded by the term “contains”: “œuf” (egg), “protéine de l'œuf” (egg protein), “produit de l'œuf” (egg product), “lysozyme de l'œuf” (egg lysozyme) or “albumine de l'œuf” (egg albumen); “lait” (milk), “produits du lait” (milk products), “caséine du lait” (milk casein), or “protéine du lait” (milk protein). To provide you with as much information as possible on the wines you buy, wine producers can also include optional information, like the grape varietal, the year of harvest, the place where it was bottled or a commercial signature. Since 3 October 2007, all French wine labels have had to include a health warning aimed at pregnant women (6). The regulations require the inclusion of either a pictogram or the following message: “Drinking alcoholic drinks during pregnancy, even in small quantities, can have serious consequences for the health of the baby.” This wording must be placed where it can be seen at the same time as the alcohol content.